Since 2015, Media Genesis has worked with Motor City Match (MCM) to establish their branding and development. MCM is a program for entrepreneurs looking to start or expand their business within Detroit. The goal of MCM is to help start new, permanent businesses in Detroit’s commercial neighborhoods by matching businesses with Detroit’s best available real estate. MCM provides competitive grants, loans, and counseling to help both building owners and business owners get open. The homepage was updated to highlight the swift impact that Motor City Match has had since their founding. We restructured the layout of the Resources page into two columns based on the type of content being: Tools or Details. These were defined based on how a user utilizes the items on the page. For example, “Service Providers” allows users to look through the different technical assistance providers that are within the MCM program and can be used to help their business. Whereas the “Lease Agreements” gives users all the documents needed prior to any development. One of the website’s key features is the “Make a Match” map that now includes a proximity search feature. This means users can search for different properties by address or intersection within the Detroit area. Based on what a user enters, they will receive a results listing from closest to furthest. They also have the option to select the distance from the location they enter by ( ½ mile, 1 mile, 2 miles and 5 miles). This new proximity search is also integrated with the current filters on the page, allowing the users to have an even more refined search result. This update also included modifications to the layout and design of the page so as to include both the existing filter parameters and new search features. The “Technical Assistance Providers” page was updated to include an accordion style dropdown for the different category types and services offered through MCM. This new update allows users to select which type of service they would like to see without having to scroll through a long list of names. Icons were also added to each category to add visual elements and create brand consistency throughout the website. This enhancement was done to improve user interaction on the website. The Events page now includes all of MCM’s social accounts and allows users to stay connected and share the latest information on MCM and their winners. Lastly, we optimized the website to be completely responsive for users. With MCM’s web traffic being just under 50% mobile, we enabled the site to be viewable from a desktop, tablet, and mobile device. Users are now able to view property listings from a map, or apply to the program right from their phone! 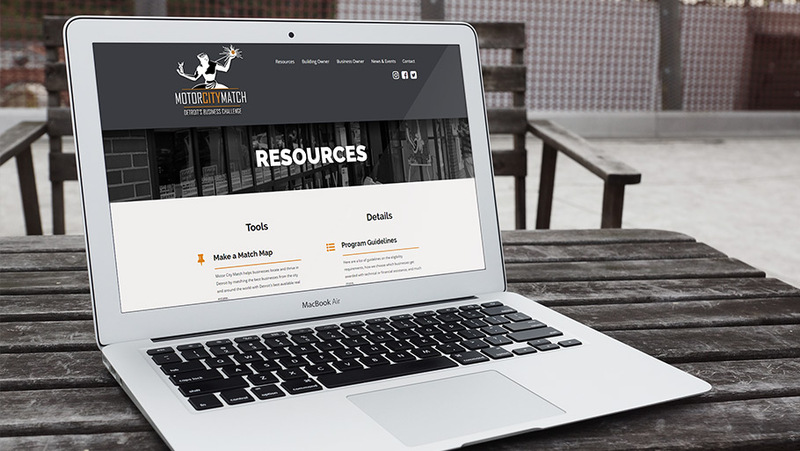 Want to see all of Motor City Match’s website enhancements? Check out the updates on their website here!